Hello there ! 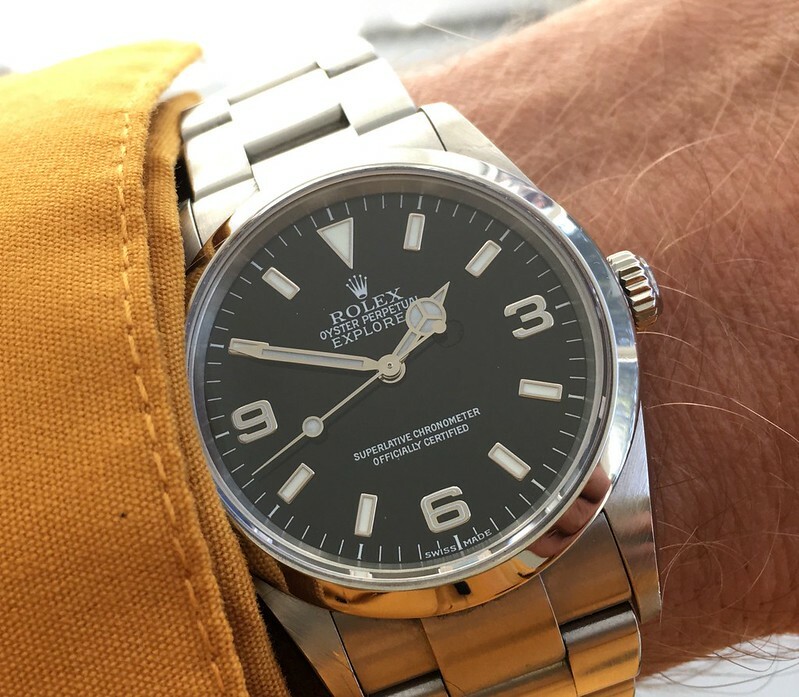 well after my post about an exployer 1 i was interested in but without papers but with a recent Rolex service history I popped into the AD and purchased it ....Rolex are the only brand that i am fearful of being landed with a fake or franken watch ! . The fact is though that i am loving 36mm again and the only way to purchase an exployer is secondhand if 36mm is your thing ..nothing wrong with the 39mm but to me compared to the 36mm the proportions are just not quite so perfect ! . Anyway by a stroke of luck my local AD happened to have one that had been taken in part exchange this is a great local jeweller which has remained family owned and in the same lovely old building for over 200 years . The model 114270 was what i was looking for and the watch had one previous owner a local guy known to the jeweller ,as mentioned the watch had no papers but was sent off by the jeweller to Rolex for a complete service then returned to the jeweller and put in the safe while the owner made up his mind weather to sell it or not ..so it was presented to me with Rolex service receipt and warrantee card , so for me as well as the information about the watch the recent service and warrentee card and especially since it was sent to Rolex by the jeweller authenticates the watch . So i am a very happy man i have the watch i want in pretty much mint condition bought from a very nice local jewellers in my home town ...and supporting the high street is i feel a good thing !. Sounds like an excellent find. Rolex service papers give the watch a 'pedigree', with the serial number verified etc, well worth having. Enjoy.....you don`t have to be the stereotypical Rolex fanboy who drools over BLNR, Daytonas, ceramic Subs etc to enjoy this one. .....you don`t have to be the stereotypical Rolex fanboy who drools over BLNR, Daytonas, ceramic Subs etc to enjoy this one. Correct. You don’t need to comment either. Why not just allow people to choose what they enjoy.l? If I didn’t already have an omega aqua Terra I would buy one of these. Lovely watches. A cracking result for you! A watch I must admit I'm warming to as I get older (having had Subs, DJ's etc). I like the white infill. Is it lumed? Yes i must admit it may well end up as my watch of choice ....My lovely Dornbluth 99.1 ...My vintage 69 Omega speedmaster racing, Sinn 856 UTC and the others ....may not see to much action now ..maybe time for a cull !!!!! Congratulations on a great find. A lovely understated, versatile, quality watch. Sounds like a good buying experience too. The point I`m making is valid; there's a whole lot more to Rolex than the forum darling watches. I still own two Rolex myself and I`ll continue to do so. Once you look beyond the so-called sports watches they do make some nice stuff. Part of the stereotype Rolex fanboy thing is being over-sensitive to criticism of the brand in any shape or form. No the point you are making is not valid. You are just a bore. Not one poster has said he should have got a Daytona or BLNR. Now go polish a bracelet or something, there’s a good lad. Apologies to the OP I won’t argue further with him on your thread. I had an Aqua Terra whilst I owned my Explorer 1, and I never saw the two as overlapping in any way. However, the day before I bought my Explorer (2008 I think) I had chance to buy an Omega Railmaster 36mm that was only a few months old. I chose to go with the Explorer, but in hindsight I should've bought both. Apart from the financial outlay, which seemed a bit heavy at the time, I saw both watches as being too similar. Classic case of overthinking it, I've since tried to find a Railmaster but gave up when the prices got too high. I never regretted buying the Explorer, but I certainly regretted not scraping the bottom of the piggy bank and buying both, it would've been money well spent because both were very keenly priced. Reads to me like you are the one creating an argument. Bizarre indeed. Enjoy it op. Here is mine. Hey let’s not argue over brands models etc .... everyone has different tastes and most carry a wide range to satisfy a wide verity of tastes .... one of the most important aspects of life is to find your style and not be swayed by this or that trend , just buy what appeals to you ! . 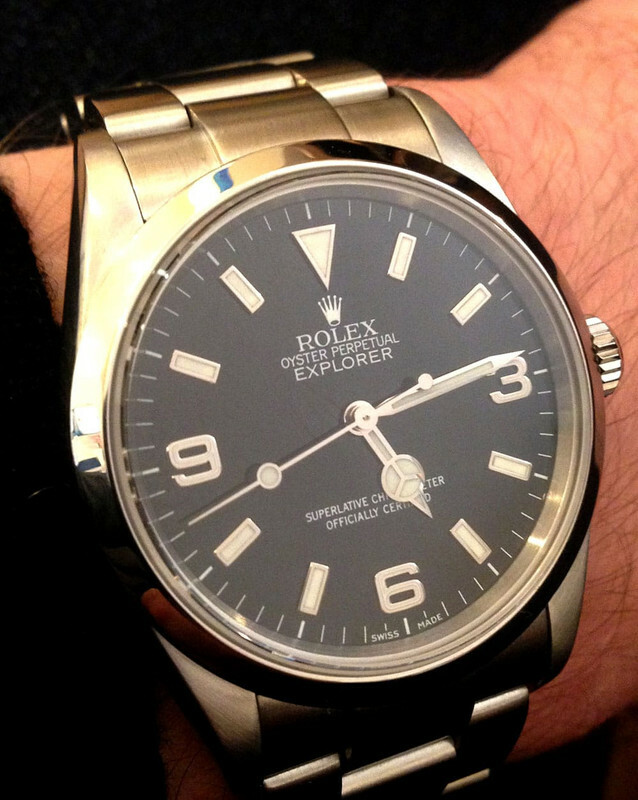 And although I am not a Rolex fanboy this particular model appeals to me and I shall enjoy wearing it :)) . He's like that, he gets a bit touchy. However, he can't be such a big fan of sports Rolexes because despite having the knack of getting hold of the hard to acquire models, he doesn't keep them, he sells them on (usually at a profit)......a bit like a dealer really. When he made a nice profit on one last year I light-heartedly suggested he put a grand in the fundraiser, I don't think he's forgiven me. Last edited by walkerwek1958; 12th February 2019 at 14:19. What on earth is your problem?! My Son added one to his collection yesterday after scouring North West UK to try and find a new one,very nice indeed.